When we purchase something, we want it to be as complete as possible. More often than not, buying items separately costs more than investing on a single package with all the necessary accessories. 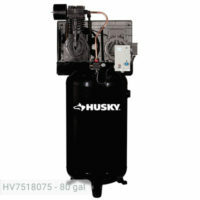 Fortunately, Husky came up with its Husky 3-Gal. Oil Lubricated Air Compressor and Accessory Kit for consumers who want to save money for other things. 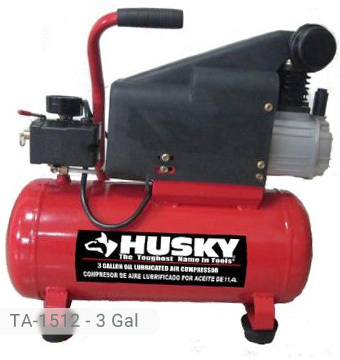 Together with the Husky 3 gallon air compressor, the accessory kit includes the following: tire inflator with gauge, 25 ft. coil air hose, 6-piece blow gun kit, dual tire chuck, 1/4″ female plug. 1/4″ female coupler, (2) 1/4″ male plugs, and sealant tape to hold all components together. 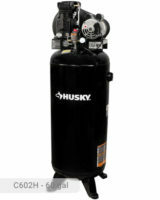 Husky 3 gallon air compressor has an oil lubricated pump with a cast iron cylinder for maximum durability. To monitor the level of oil accurately, there is an oil sight glass provided. Make sure that you glance at this glass once in a while during the machine’s operation to avoid oil leaks. There is a steel air filter installed to make sure that dust and other contaminants are trapped and would not clog the parts. The filter element is replaceable and can be changed easily. The pump (direct-driven) can deliver 2.2 SCFM of air at 90 psi. Its maximum pressure is at 125 psi. Coupled with a 0.8 HP induction motor, the pump offers a powerful, reliable, and efficient output. This is perfect for your inflating and nailing jobs. The pump offers a life expectancy that is four times more than other oil-free universal motor compressors. Trim work and blowing of tires can be quickly performed using this model. However, the SCFM of air is not enough to power tools used for heavy-duty tasks such as sanders and frame nailers. Also, it can only be used limitedly for medium-duty tasks. For lighter tasks, it will surely provide a high-quality service. It can drive 1.5-2.5″ finish nails before recharging the tank. 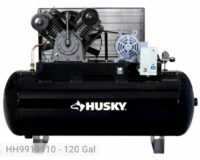 Your trim guns and framers are compatible with this air compressor. Your tires will get filled up quickly with the machine’s awesome pumping ability. 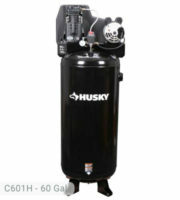 The 3-gallon tank stores enough compressed air to perform light-duty applications. It is powder painted and made of steel. It has a pressure gauge for the regulation of air pressure level. It has a horizontal orientation and feet that provide balance to the entire structure. 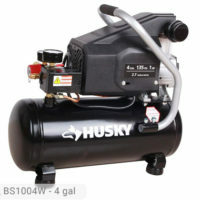 Husky 3 gal air compressor has a compact design making it very portable. The rugged steel handle allows you to carry it around from your house to your workplace. It weighs 40.7 lbs. so transporting it would not be too much of a hassle. The level of noise is low (approximately 52 decibels only) so no need to worry about disturbing the entire neighborhood. You can keep it indoors as long as the location is clean and dry. For DIY people, Husky 3-Gal. Oil Lubricated Air Compressor and Accessory Kit is a good investment. The accessory kit can save you the money and effort of buying them separately. If you are working on a tight budget, check this out and be amazed with this deal. If you already own Husky TA1512 model or just want to buy it, feel free to share your review or ask a question through the form below.